On Monday, Apple updated the iOS 8 Beta to Beta 3 and Mac OS X Yosemite to Developer Preview 3 (DP3). This article gives some useful links to learn more about iOS 8 and Yosemite. The upgrade of iOS 8 on my iPad Air took about 31 minutes. The download only took a few minutes and the rest of the time was on the device preparing, installing and rebooting. While the Yosemite update took about 16 minutes total. For iOS 8 Beta installation steps, tips and more check out my blog article How To Safely Test iOS 8 Beta. For Yosemite Dev Preview installation steps, tips and more check out my blog article How To Safely Test OS X Yosemite Beta. MacRumors iOS 8 Beta 3 Tidbits has the latest coverage on Beta 3's new features. MacRumors iOS 8: New Features roundup page includes info on hidden and undocumented features. MacRumors iOS 8 roundup page is their general iOS 8 page. MacRumors reports Health App Gains Ability to Track Steps With M7 Motion Coprocessor. 9To5Mac has more details. This is the first real data that the Health app is able to display. I especially like Handoff, one of the new Continuity features that allows you to start working on something on one device running iOS 8 or Yosemite and switch to another device and continue your work right were you left off. See Handoff on OS X Yosemite and iOS 8 in Action. MacRumors Yosemite Dev Preview 3 article has the latest coverage on DP3's new features. 9to5Mac article on Yosemite DP3 has has a little more detail on features and screen shots. 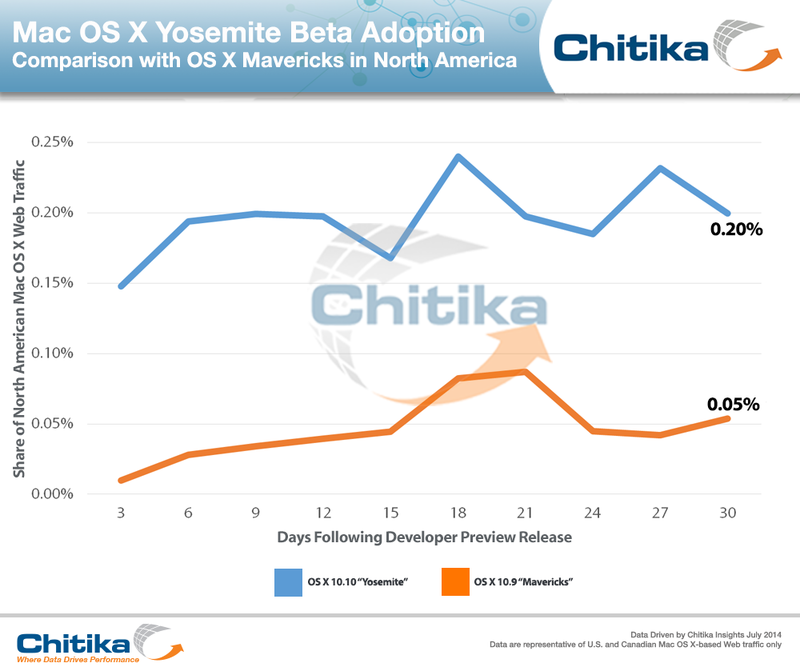 Chitika reports web analytics that show OS X Yosemite Developer Activity Nearly 4X that of Mavericks. MacRumors Yosemite roundup page is their general Yosemite page. 9To5Mac has a top 5 features video. MacWorld has a number of hands-on with Yosemite articles.